Welcome to the mad house, where all is not as it seems. On the outside it looks fairly normal and you would never suspect a thing, but inside those walls, behind that front door... it is a whole other story. There is always someone shouting, more often than not the younger siblings will be arguing over the television..and each door will have been slammed at least 10 times. There is always something going on and never really a quiet moment. In this 5 bedroom house live 7 people, yes that's right! 7 people! My parents, My Brother and Sister, Luke, Myself and Leo. You see this is my parent's house, Luke and I were going to be gone long before Leo was born. Things never work out as you planned though do they? We were going to buy a house before I started to show my baby bump, however that all fell through and there was no-where that really screamed at us to make that big step into buying our first home. The months crept on...and on. My tummy expanded and that perfect house never came up, so we stayed put under the pre-tense that their would be enough room while Leo was still in his moses basket, Luke and I had discussed renting when the time came for Leo to move into his cot. It was then that my dad came up with a plan to turn the un-used dining room into another bedroom. My younger Sister had decided she would leap at the chance of a bigger bedroom downstairs and that then freed her room up to house Leo, giving Luke and I the opportunity to save money when I return to work, give us a better financial standing and eventually give us the chance to buy our own home. In the mean time it meant that Leo could move into his cot bed and have his own room. You see this 5 bedroom house is full to bursting. I am one of four siblings and up until the end of last year we had all lived at home...In the mad house. My younger brother moved out with his Girlfriend just after the plans to convert the dining room had begun, leaving another room empty. However the mad house is about to become even more busy and hectic. You see my brother is moving back home and bringing his Girlfriend, you see.. His Girlfriend is Pregnant. They currently live in the middle of no where so they want to come back home, save, and be out around August time. The baby is estimated to be with us around October which means that I am going to be an Auntie! I found out this amazing news around four weeks ago, I was the first person to know...Which was a real honour. It brought back memories of when I first found out I was Pregnant. I didn't believe it and nor did she, all until you see that little bean on the Sonographer's screen for the first time. The scan is booked for the 20th March and then we will know exactly how far along she is. You see she is estimated to be 10 weeks....However her bump does not look that of a 10 week pregnancy. I know everyone shows in their own time, but the thought remains: Is she further along? Or could she be carrying twins? 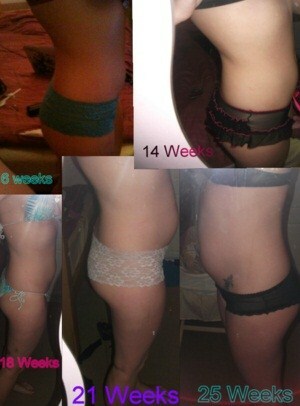 The picture on the right, is my bump progression! Everyone is very happy and I can't help thinking just how perfect it all is. The age gap between bean and Leo is going to be just over a year. In the long run that age gap is going to be nothing, and I am sure they will be the best of friends! So next month the move will take place, my Brother and Heather will be back at home in the mad house. It is a crazy place to live but it is also home. I think when the time does come to move out of the mad house, it will take a while to adjust to the silence. In this 5 bedroom house live 9 people, yes that's right! 9 people! My parents, My Two Brother's and Sister, Luke, Myself, Leo, and finally my Brother's Girlfriend Heather. Of course if you count Bean...then I guess that's almost 10! I am sure everyone feels they live in the mad house at some point along the way. Every family has their life adventures. We just live them all from the Mad House, just outside normality, where nothing is as it seems. And congrats on soon to becoming an auntie! It will be lovely for bean and Leo to be that close in age. Mark's sister is currently pregnant and is 6 weeks behind me so the babies will be very close in age. And your bump is so cute. Morning Lovely! I hope you are feeling better today! It is nice to have everyone around, especially in those early days of having Leo -but part of me cannot wait to get our own place. They are doing us a massive favour though letting us stay and save so I am very grateful! I bet it has been amazing going through pregnancy with 6 weeks difference! Your babies are going to be friends for life! I think it is nice to be able to stay at home, and like you said it is not worth moving out just so you can say you have moved out! Thank you very much, I am sure she will be fine! I am looking forward to watching her bloom! Sorry to hear about your Brother In Law, I hope things all work out for you! How lovely that your little boy is surrounded by your family, he must be brought up with so much love around him. I think it's lovely! Hi Emily, That is the way I like to look at it. There is always someone who wants to play with him and make him smile. That is probably why he is such a happy little soul! The problem may be that we have all made him the centre of our attention, and when we move out he may find it very strange it being just the 3 of us! How nice for Abi! I bet she loves having such a good friend in her younger cousin! I bet they will have a close bond in the years ahead. I can't believe how small your bump was! At 13 weeks people came up to me in the streets to ask when I was due, from 26 weeks people kept telling me I must be ready to pop, and by 30 weeks I was starting to outgrow my maternity clothes! Congratulations on being an aunty! I can't wait for my brother or sister to sprog up! Hey Becky! Really from 13 weeks? That is impressive! Saying that though, If Heather really is 10 weeks she has a pretty bumpalicious bump already! There is nothing more annoying than people saying you must be ready to pop! The amount of people that said that to me...I would quite happily of popped them! Thank you very much lovely!I am tres excited!